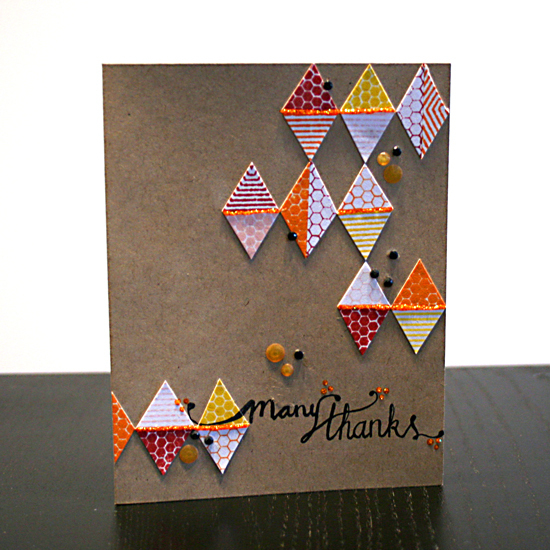 I really liked the look of the die-cut greeting on my ‘Absolutely wonderful’ card, so I decided to create another one. 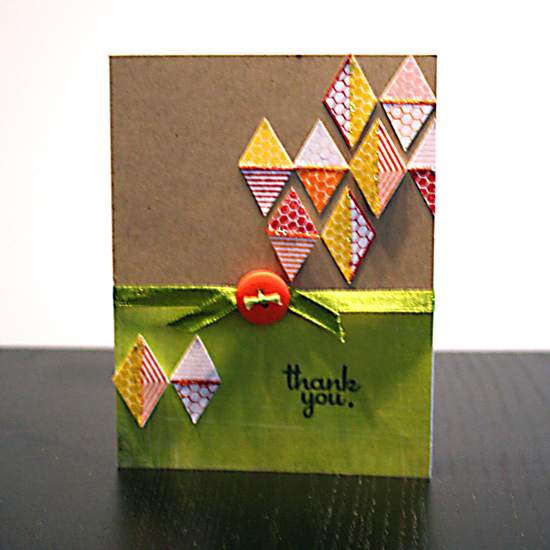 This time I used a banner die from Simon Says Stamps as well as my trusted Papertrey Ink letter dies. I also made a watercolor background, to shine through the negative spaces. 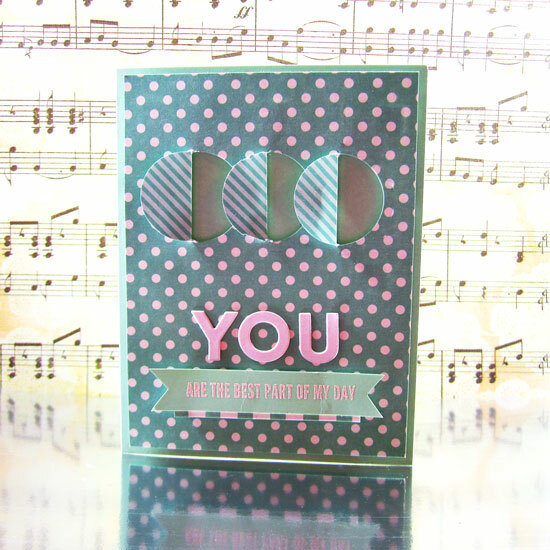 I started out with the background, I stamped the background image with Versamark ink and white-embossed it with a heat gun. Then I used inexpensive watercolor set, that I got at my local Michael’s, and simply added a wash of light peach, pink and yellow colors. 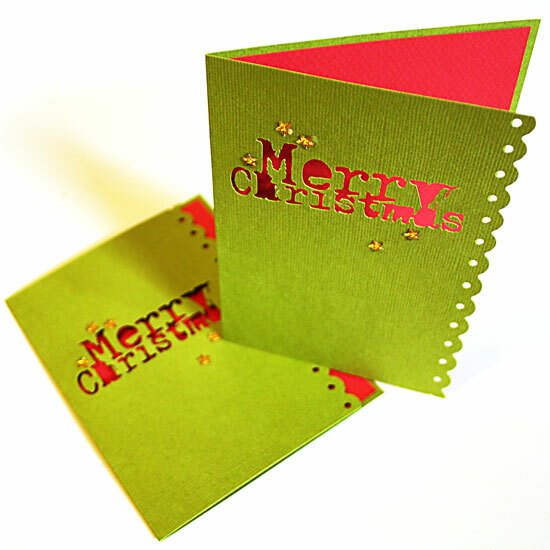 I used a ton of water which caused some warping, so I doubled up the card base with another sheet of cardstock underneath. I really like the result and will definitely try that again. Next, I cut a slightly smaller panel of cardstock and laid out the individual die-cuts on the panel, secured with some repositionable adhesive and ran it through my Cuttlebug. 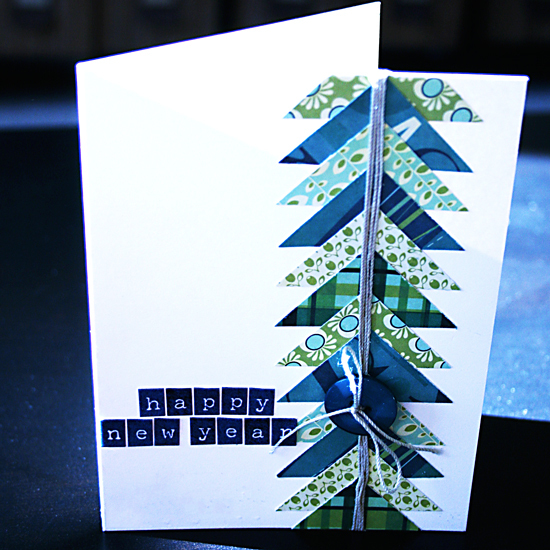 I attached the die cut panel to my card base with foam adhesive. Note that the banner die-cut had cut my panel into two pieces, so I adhered each one individually. 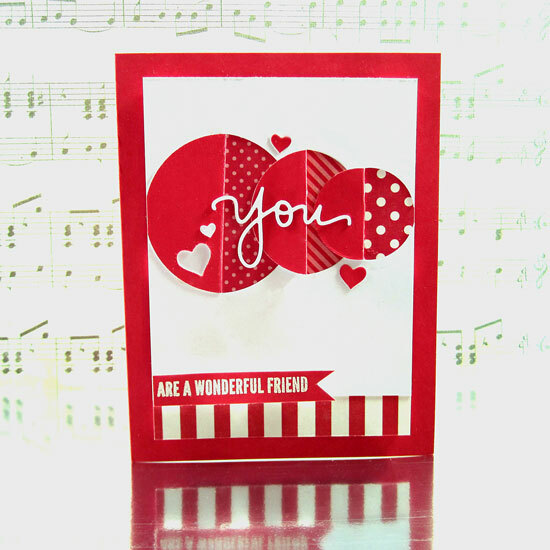 Next I added a pop of color with a wood veneer heart by Studio Calico, which I dyed orange with the same watercolor set, then added some orange Stickles on top. 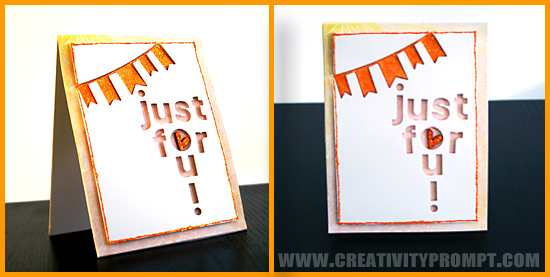 I decided that my card need some more color so I covered the banner ‘positive’ with the same orange Stickles and adhered it flat on the card base, right under the ‘negative’ impression. I also ran a line of Stickles around the perimeter of my panel. I am taking another class from Jennifer McGuire and Kristina Werner. 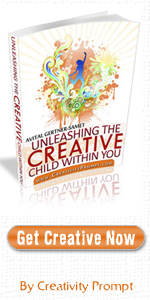 This time I’m taking ‘Kick Start’, which is all about boosting your creativity. 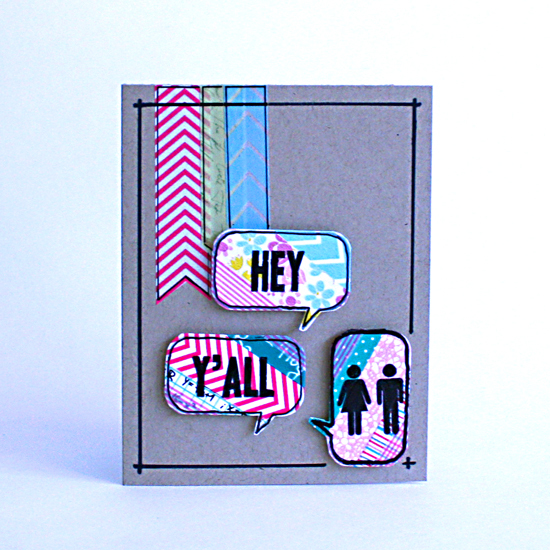 Anyhow, I used it with my new Absolutely die-cut (designed by Kristina Werner for Simon Says Stamp) and came up with the idea to use two die cuts on one panel so I can have both a negative and a positive impression of a word. The different shadows the words cast are really interesting. 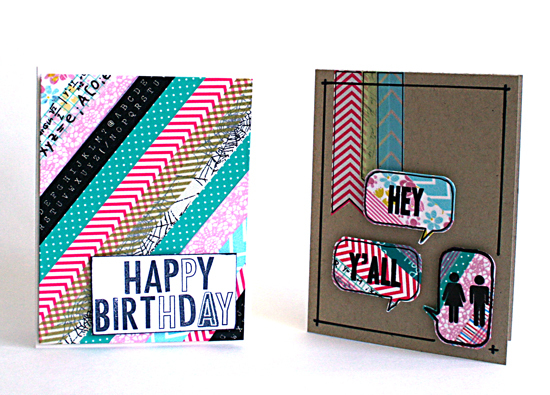 I lined up both dies on my cardstock panel and ran it through my Cuttlebug. I prevented movement by temporarily sticking the dies to the cardstock with removable tape. 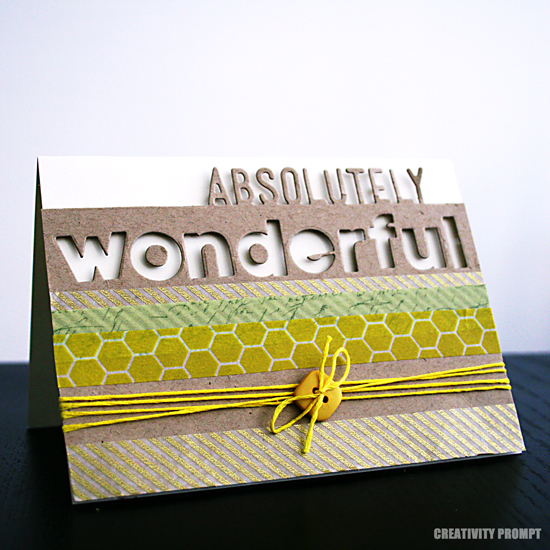 Side note: I looked for a word with no repeating letters to go with ‘absolutely’ and ‘wonderful’ won… – It isn’t necessary as I could use place holders for repeating letters and run them through the Cuttlebug a couple times. 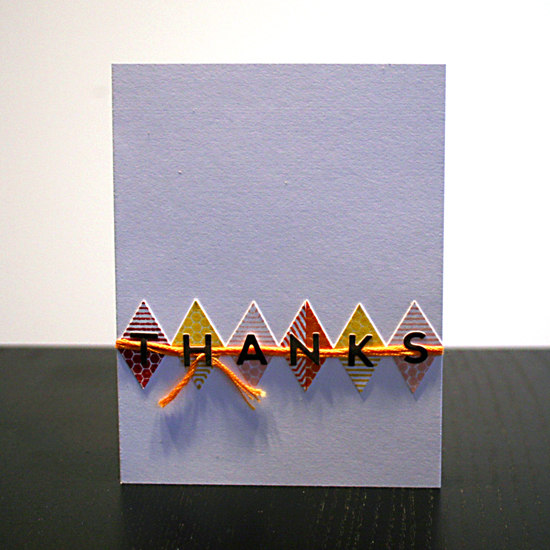 To spruce the card up a little bit I used some washi tape stripes, an embroidery floss and a button. SUPER simple, but I really love the clean and simple result. I used the one by Papertrey Ink that I bought a while back. My husband captured this moment with his Android when I wasn’t looking and I really liked the fact that he encapsulated not only the moment but a theme in my current life. I added a scribble on the top left side of the layout “When a law degree and a dual license to practice aren’t enough”, as I felt it gives the story a bit more depth, as this is not a picture of me studying for a class, but a picture of me acquiring more knowledge and absorbing more information in a quest to swallow the world of knowledge that is out there. A quest that has no rhyme or reason to it and has no specific path. I’m taking coding classes, mathematic classes, history classes, English literature classes, Ethics classes – as well as classes for my Continuing Legal Education credits quota. I’m nuts like that. Whenever I feel especially overwhelmed with lack of time and pressure to finish things, I just add another class that I either self-study or take online. It was fun trying a new look, but you can tell that layering isn’t my strong suit… Mainly because I lose patience along the way and start adhering things down too soon. I also added some concealed journaling inside the itty bitty envelope under the photo to include more details and personal notes. 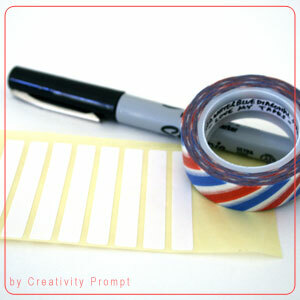 I glued an old ribbon that looked exactly like my washi tape to pull the journaling spot from its place. To all my Jewish readers and friends – Happy New Year! May you have a sweet and wonderful year. 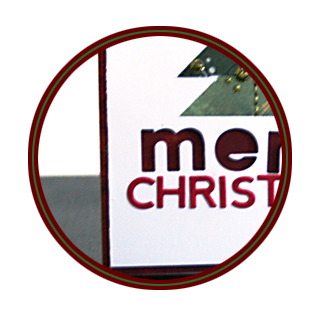 To all my readers of all religions and beliefs – Have a good one and enjoy each day to the fullest! 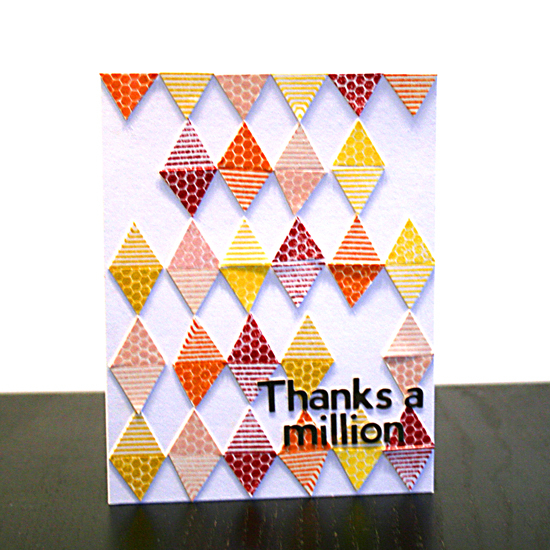 To make it I cut a bunch of squares from a 6″ by 6″ paper pad and cut each square in half to make a triangle. Then I stacked all the triangles together and instead of machine-stitch them, I laid a line of liquid glue in the middle and wrapped twine a few times around it, then I threaded the loose ends through a button and tied them into a bow. 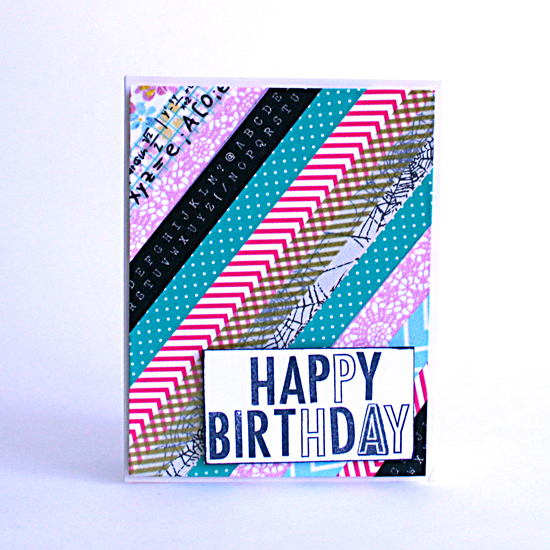 I looked for a “Happy New Year” stamp in my stash but didn’t find one so I used mini letter stickers instead. 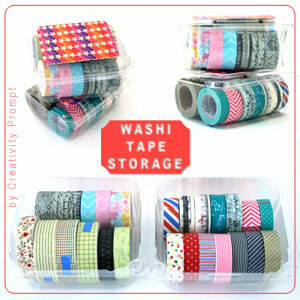 I am completely obsessed with washi tapes. I am also trying out different brands for a future review (stay tuned). There is something else I’m nuts about – berries and cherry tomatoes. I eat about a package of tomatoes a day (!!!) and I also eat a ton of berries. They are the perfect size and they are clear, which I love. Plus they are totally stackable. All I do is:  give the tiny basket a good wash (NOT in the dish-washer, unless you want to see a molten basket…);  take off the label; and  adhere a cute piece of patterned paper on top. As it is important for me to keep track of the brand and product names, I also add a tiny label to the inside of each tape roll. I use regular label stickers from an office supply store and write with a permanent pen to prevent smudging. It’s super easy and totally optional. What is your favorite storage system for bits and pieces? 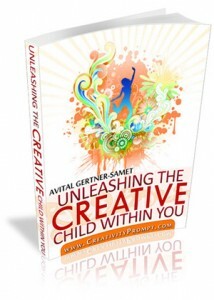 Please leave a comment with your clever suggestions, I love reading them!